Wits health science students hosted a two day health fair on July 20 and 21 at Solomon Mahlangu House Concourse to raise awareness about health issues faced by students. The students offered a number of healthcare checks including dentistry, dermatology, eye testing and physiotherapy. The event which was hosted by Jesus Christ To All Languages (JTL) society together with the Wits Campus Health and Wellness Centre (CHWC) also provided services related to specific men’s and women’s health issues along with dietary and chronic conditions. Participants were also able to donate blood and make use of aerobic and resistance training stalls. The acting head nurse of CHWC, Sister Maggie Moloi, told Wits Vuvuzela that male healthcare was one of the priorities at the fair. The CHWC have partnered with Wise Up, an operation which focuses on Voluntary Male Medical Circumcision (VMMC). Dr Lubwana J. Kigozi from the VMMC project, who was also present at the fair, said that the aim of his organisation is to ensure that males are given knowledge about their medical healthcare so that they can voluntarily go for circumcision which is shown to reduce the “risks of acquiring HIV by 60%,” in males. The high cost of health is one of the factors preventing students from getting regular health checks. “The only option left for students is to go to the public sector which can be a tedious process because you cannot wait an entire day when suffering from sinusitis,” said Mungure. 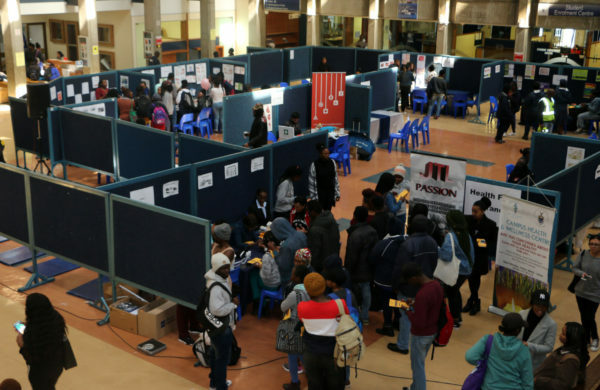 “Some of us do not have enough money to go to campus health, so this fair makes it easier,” said Dimakatso Hlahlu, a Wits second year geology student. “I wouldn’t necessarily go to the doctor to check up on my health because the medical aid does not pay the full amount and I would have to top up,” said Yenzokuhle Hleta, a second year Wits mechanical engineering student. Moloi added that ignorance also prevents students from thinking about their health. “Students tell themselves that they are only here to study and don’t have to look after their health. In the long run they end up with high blood pressure with the stress they get from studies,” Moloi said. Wits Vuvuzela, HEALTH FOCUS: HIV/AIDS testing turnout increases, April 24, 2018.